Pretty Beach House redefines the typical guesthouse tradition and sets a new benchmark with its signature appointments and world-class approach to every aspect of the guest experience. Now with four private pavilions, three freestanding and one penthouse, Pretty Beach House can sleep 8 people at any one time. 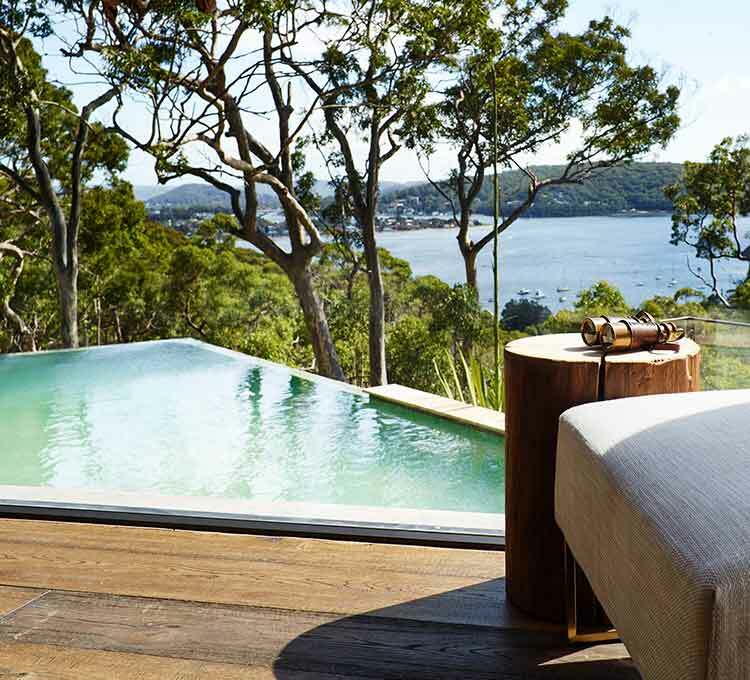 The pavilions have names that describe their best feature; Treetops, Bayview, Hideaway and The Retreat (two stories) and all have views of the angophoras, across a dramatic escarpment and down to the sparkling bay waters of Broken Bay. 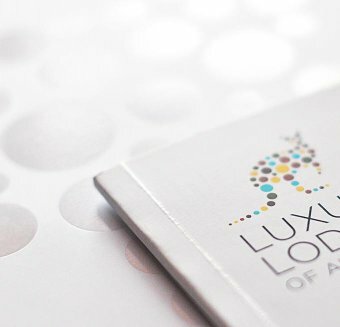 Each pavilion has a generous king bedroom, separate dressing room, deluxe bathroom, open-plan sitting area and a fully stocked bar. Colours and textures of the surrounding landscape inspired the look & feel of the interiors and furnishings. The Main House built with hand-made mud bricks, and huge hand crafted timber posts from a de-commissioned bridge in Queensland, is a shared space for guests. The main house, features the spectacular dining room, impressive bar with remarkable views and an open plan Italianate Ambach kitchen, encouraging guest and chef interaction. The hexagonal bar area is designed for conviviality and sharing fine foods and afternoon cocktails as the sun sets. Guests are encouraged to eat anywhere on the property, however the main house with its spectacular dining room, hand crafted fireplace and soaring ceilings is the centre of all culinary activity. This impressive split-level room constructed with massive slabs of local sandstone and enormous floor to ceiling timber poles, showcases a significant private art collection of some of Australia’s most celebrated and revered artists. The Main House also includes a lounge area and cocktail bar, an intimate dining space for two, a wine cellar, open fireplace, infinity pool, day spa and a generous pool lounging deck complete with a custom made Stefano Ferrara Italian pizza oven. Guests can spill to an outdoor lounge area and fire pit that looks directly onto large boulder rocks with ancient aboriginal rock carvings dated back almost 10,000 years. All pavilions include; walk-in robe, fine Busatti hand loomed bed linen, Busatti linen bathrobes, own hand made Bouddi bath products, in pavilion mini bar, housekeeping and service, optional climate control, fireplace, iPod music system (with MP3 input), coffee table books and magazines, board games and cards, safe and telephone. It is the rustic handcrafted elements paired with the ultimate luxury of fine Italian linen and made to order soft furnishings inspired by colours of the surrounding landscape that gives the four distinctive Pavilions of Pretty Beach House an unrivalled chic and style and true sense of relaxed luxury. As its name implies, Bayview commands a mesmerising view from the deck through the forest to the sparkling waterways below. This one bedroom split level pavilion features a king sized bed and spacious indoor and outdoor living areas. A walk in dressing room sits adjacent to the bathroom, which opens to the heated plunge pool. In cooler weather sink into the luxurious sofa and cozy up with a game of chess or backgammon beside the combustion fireplace. Being farthest from the Main House, Hideaway sits high at the tip of the property and is the most secluded pavilion. It is similar in style but somewhat larger than Bayview, with a decadent double day bed and oversized kidney shaped plunge pool. ‘It feels as if you are completely cut off from the rest of the world, floating amid views of bush and water“, says Chris Manfield, one of Sydney’s most celebrated chefs. She declares Hideaway “our new weekender, easily reached from our Sydney base." Treetops is a grand double story pavilion attached to the main residence - the penthouse position. Enter via private entrance into the top level with living room, and balcony with views over the treetops and across the entire property. A second dressing room and bathroom with glass doors on this level also allows this vista to be enjoyed while taking a rainfall shower. Downstairs the spacious bedroom suite opens to a secluded sandstone courtyard with heated infinity plunge pool and day bed. The king bed made from pieces of a scribbly gum add to the romance of the room while the freestanding bath tub in the adjoining en suite is an indication of the luxurious Treetops experience. Spread over two levels, this is the largest of the pavilions. Offering separate living space upstairs with a wood burning fireplace and powder room, whilst downstairs is a king size bedroom and luxury bathroom with bath, separate shower and heated flooring. Outside boasts a generous private deck with double day bed, overlooking the heated plunge pool.